The transient electromagnetic method (also known as TEM or TDEM) is a geophysical method for exploring the sub-surface resistivity structure of the earth. In the loop TEM sounding method, a current is induced in the ground by a time-varying magnetic field of a controlled magnitude generated by a source loop. A loop of wire is placed on the ground and a constant magnetic field of known strength is built up by transmitting a constant current into the loop. The current is then abruptly turned off. The decaying magnetic field induces electromotive forces in the ground. The induced current is initially concentrated below the ransmitter loop, but then the current diffuses down and away from the transmitter. The current distribution in the ground generates a secondary magnetic field that decays with time. The decay rate of the secondary magnetic field as a function of time is monitored by measuring the voltage induced in a receiver coil in time gates. The current distribution and the decay rate of the secondary magnetic field depend on the resistivity structure of the earth. The decay rate, recorded as a function of time after the current in the transmitter loop is turned off, can therefore be interpreted in terms of the subsurface resistivity structure. The system can be used within following modifications of Transient Electromagnetic Method: with one-loop, coincident loops and transmitter loop – receiver coil configurations. is intended for acquisition and digital conversion of the input timedependent voltage. Discrete readings during time-off are registered continuously with 5 us step.M-IP receiver. Then measuring results are grouped within time gates (windows). Mean voltage values calculated within each time window correspond to midpoints of time windows (time is counted off from the descending part of the current pulse). Time-ON is equal time-OFF and may be set in the range 10 ms – 1s. Time windows number depends on time-off duration and varies between 42 (10 ms time off) and 74 (1 s time off). Maximum input voltage: 10 V.
Industrial noise (501 Hz) suppression – 60 dB. When measuring input voltage the receiver operates synchronously with the transmitter that produces opposite polarity rectangular current pulses with 50% duty cycle. Receiver – transmitter synchronization is provided by the reference (synchronization) cable or GPS synchronizers. Number of accumulations per one measuring cycle – from 9 to 24000. An external computer with the wireless Bluetooth interface or cable serial interface RS-232 is used to operate the receiver. An internal battery (12 V) is used to power the receiver. 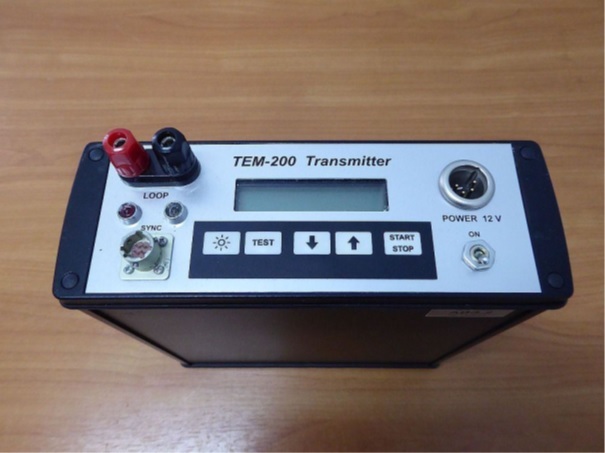 TEM-200 transmitter energizes an inductive load (loop) as a source of primary magnetic field in Transient Electromagnetic Method. It generates bipolar rectangular current pulses with pauses (50% duty cycle). The transmitter is controlled by the synchronization pulses that are produced by the TEM-IP receiver or the GPS synchronizer. Current ramp time (drop from 0.9 to 0.1 of current level) is under 20 us at a load with 0.8 mH inductance. Output current range is 1 – 10 A with discrete increment 0.5 A. 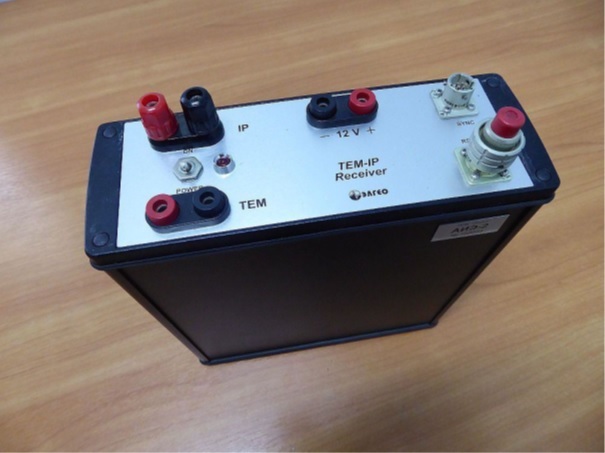 Maximum output voltage – 20 V.
The TEM-200 transmitter is powered by the external 12 V battery. The main parts of the AIE-2 system for TEM measurements are TEM-200 transmitter and TEM-IP receiver. The TEM-200 transmitter generates into the ground the primary pulse magnetic field, whereas the receiver is intended for recording the transient response of the secondary field using ungrounded receiver coils. The TEM-200 transmitter is loaded to the transmitter loop of copper wire which is laid out on the ground surface. The transmitter generates periodic bipolar current pulses into the transmitter loop, according to the timing sequence assigned by the receiver through the reference cable. Current pulses in the transmitter loop produce pulse magnetic field that induces decaying eddy currents in the conductive ground. 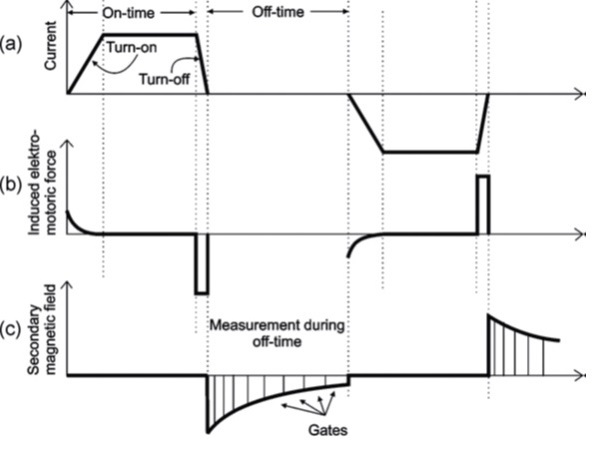 When the receiver operates in TEM mode, it measures the electro-motive force that is induced within the transmitter (one-loop modification) or separate receiver loop (coincident or twoloop modification) during time-off. ZONDTEM1D is a computer program for 1D interpretation of profile data obtained by transient method.